A nameless orphan growing up as a servant in the king's household, Brisa learned to survive by adapting. Her closeness in age to Princess Val'Trea put her in place as the princess's lady maiden, her most trusted personal servant, but Brisa's look-alike appearance makes her Val'Trea's commanded stand-in. Ka'Sen, Prince of Planets, Leader of the Union of Worlds, can have anything he wants, except magic. The sacred home world turned from technology during the great exodus and saved the dying planet by finding magic. Those on Rosrel protect the mystical forces from outsiders. Ka'Sen knows such power would quell his enemies and cement his father's legacy. He must convince the Rosrel princess to become his wife and give him a child of magic. Brisa never dreamed the princess would command her to wed on her behalf. When nothing, not even your face, belongs to you, how do you find the courage to say no? "Brisa is a strong and compassionate heroine, whilst Val’Trea has a darkness that you don’t know much about yet. She is spoilt and unkind, caring nothing for others – you might even say the exact opposite of Brisa. 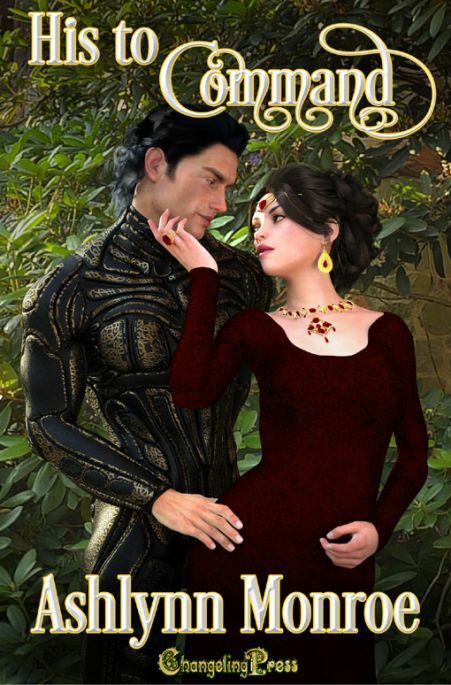 Combining Fantasy, Science Fiction, Eroticism, and Religion might not be a combination for everyone, but I thoroughly enjoyed this, and can’t wait to read the second story in this series. Most definitely recommended by me." When all the girls, even Meglena, were sleeping, Brisa stood and left as quietly as she could. Twilight's orange sunset was burning off into the gray light before nightfall. The stones were damp under her feet and the cold reached through the thin fabric of her slippers. Some houses were still dark, but most had the warm light of hearth fires lit. The shops were closed as the villagers tucked in for the night. Brisa hurried through the village to find Lee. He was a good man. He would help. "Hey," called the baker's son. "Safety in the sleeping hours." Brisa stumbled over to him and gave him a nod. "Safe sleep to you, as well." He nodded back. "Take this to Meglena, please." He handed her a wrapped loaf. She tried to hide her grin. They'd be a good match, this chubby, ruddy-faced boy, and her friend. He had a promising future. "I will. Thank you. Have you seen Lee?" "He's over at the tavern. Cards." She'd heard of his skill, but she'd never been inside the tavern. "Could you ask him to come see me at the temple?" The boy laughed. "My father would kill me for going in there. Den of reprobates he calls it. Sorry." She shrugged. "Thank you for your kindness to Meglena. She is my heart sister." He nodded. "You have done many things I would call kindness concerning our village. My gifting food to a pretty girl is purely selfish." He grinned broadly. "But I'm sure you already know I wish to court her." She sensed he was asking her permission, even though she had no right to expect it. The gesture made her like him even more. "You can court her, and if she's smart, she'll let you." His face reddened brighter than its naturally jolly color. Brisa put her hand on his shoulder. "I'll see she knows who to thank for the gift. She's a bit under the weather, but when she feels better, I'm sure she'll come see you." "Under the weather? What ails her?" His concern was intense and proved his feelings. "It's fever. Please keep this between us. You know how illness panics. I need Lee to help me get them wood to stay warm." "They're all sick?" Now he sounded worried for more than just Meglena. "No," she lied. "It's just that the littles are so small. I was hoping Lee could help with the chore, that's all." He let go of a breath, and his shoulders sagged. "That's good. I'm sorry I can't go get him for you." "I'm glad you are obedient to your father. On the morrow." "On the morrow, Lady Brisa." She bristled at the honorary title, but hid the reaction with a polite smile before rushing off toward the tavern. Laughter and noise streamed out of the well lit stone building. Women of low reputation walked with men down the path, and she saw a stable boy watering the horses of a newcomer. She paused, nervous about going farther, but her littles needed her to have courage. She wasn't a child anymore for Goddess's sake. Straightening her shoulders, she walked ahead as if this was a normal visit for her. Lee. Thinking of him made her smile. He'd be surprised to see her in the tavern. Lee. So reliable. Such a good friend. He'd been helping her since the beginning. He'd seen her trying to carry a little boy who was almost as tall as she was. He'd taken him from her arms and helped her get him to the temple where she'd managed to save his frozen legs. That little boy was a farm hand now, but he often brought the temple children fresh food. He knew her favorite was rabbit and always snared one for her when he came. Without Lee, she might not have been able to save him. As they'd grown older, she'd expected him to marry, but he hadn't. She wasn't sure why, but his marital status mattered to her more than it had the right to. She never doubted he'd be there for her, but if he wed that would need to change. Nervousness fluttered in her stomach as she stepped up onto the long porch and took hold of the heavy door handle to gain entrance into the drinking establishment. She'd never been inside the busy gathering place. It was not the kind of place princesses or ladies went. Lucky for her littles, she was neither. Peering through the doorway, she tried not to be noticed, but it was clear this was a male domain. Lee. His blond head bobbed. He needed a haircut. She watched his handsome face morph into a huge smile as he threw his hand down on the table. His companions wore angry or miserable expressions. When he glanced up, he gave a double take in her direction before grabbing his mug and draining the contents. Half standing, he scraped the money in the center of the table into a pile before shoving fistfuls into his pockets. One of the angry looking men grabbed his arm. "Hey! Give me the chance to win it back." Lee glared at the hand, and the man let go. Lee scowled. "Later." He hurried over to her, guiding her out into the darkness. "That's no place for you. I was starting to worry. Another day and I'd have stormed the castle." "I'm fine. It's just been very busy." "I heard. A sky ruler is coming here. Never thought I'd see that. They've been banned for so long I'm surprised the king will allow it." "My mistress is excited. Considering how badly the tech worlds want magic I suspect the king needs money. Val'Trea has been getting fitted for new dresses and very focused on the attention, but I don't think she understands why the king is lavishing so many resources on her. I believe there will be a match." Lee's blue eyes narrowed. "Would she force you to leave?" "Yes. Unless by the grace of the Mother Goddess this sky ruler doesn't allow her to bring me. We don't know their culture. Maybe a lady's maiden isn't important in his land." "If it comes to it, run with me. I will protect you." His words froze in the chilly air. When he took her face in his hands, his fingers were warm despite the cold. "I refuse to lose you." Heat burned in her cheeks. "What are you saying?" "I'm saying run with me. Be mine. The king has a long shadow, but every shadow is chased by the sun. We'll find someplace, far from here, where we can live in the brightness. I want you for my wife. Don't go back to the castle tonight."